GRAND RAPIDS June 28, 2016– The Kent-Ionia Labor Council has announced today that it has endorsed two candidates running for the Kent County Commission. 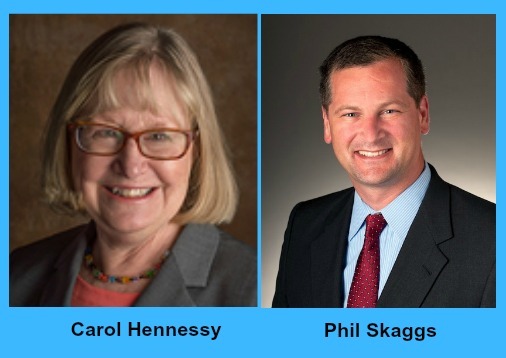 Phil Skaggs (District 19) and Carol Hennessy (District 14) both received full endorsements from the KICLC in their respective races. Phil Skaggs is seeking to unseat Republican incumbent Shana Shroll in Kent County’s 19th District. Since 2012, Skaggs has served East Grand Rapids as city commissioner and works as an aide to State Rep. David LaGrand. He spent many years in academia, where he was a member of the Graduate Employees Organization (GEO-AFT) at the University of Michigan. As city commissioner, Skaggs has been a powerful advocate for infrastructure improvements and public safety, as well as good pay and benefits for city employees. Carol Hennessy is the incumbent District 14 Kent County Commissioner, where she has served since 2006. Hennessy has been a strong ally of seniors and families while serving on the commission. She has served on the board of the Area Agency on Aging and the Senior Millage Review Committee, helping to ensure local seniors are able to live healthy and independent lives. She’s also worked with Healthy Kent 2020 and served on the board of Healthy, Safe, Drug-Free Schools. “Commissioner Hennessy has worked tirelessly for all Kent County residents, from early life through retirement,” said Egan. “And through her dedication to families and seniors, she’s committed to creating an environment in Kent County where work is valued and people are paid wages that will sustain a family. This entry was posted on June 28, 2016 by WMALC in Political news and tagged AFT, carol hennessy, David LaGrand, East Grand Rapids, Graduate Employees Organization, Kent County, phil skaggs, public safety, retirement, Shana Shroll, wages.